The history of the Netherlands is the history of a seafaring people thriving on a watery lowland river delta on the North Sea in northwestern Europe. When the Romans and written history arrived in 57 BC, the country was sparsely populated by various tribal groups at the periphery of the empire. Abt. 100 B.C. 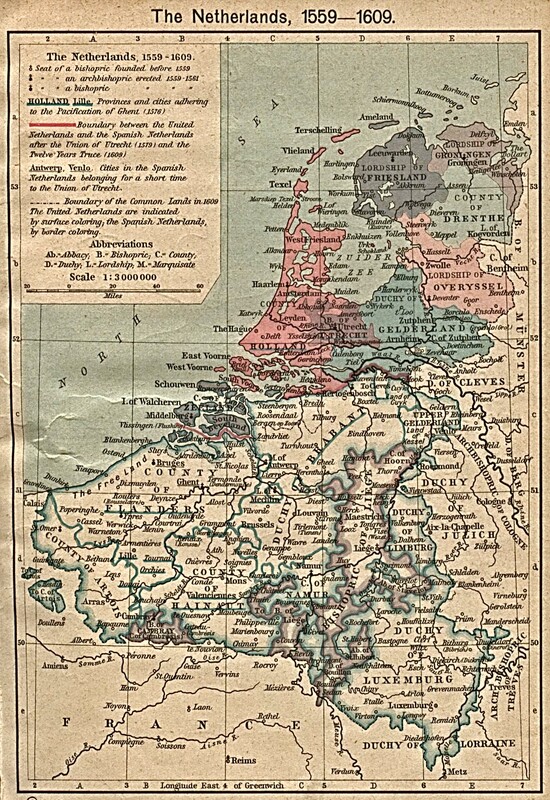 German tribes settle permanently in the Netherlands: Tubants in the eastern-, Frisians in the northern- and western Netherlands. Kaninefates settle along the coast and Bataves in the centre of the Netherlands along the rivers. • 55 B.C. Gaius Julius Caesar, Roman general, reaches the southern Netherlands. Caesar fights a confederation of German tribes in northern France and present Belgium, called ‘the Belgae’. Further northward he meets and wipes out the German tribes of the Usipetes, Tencterians, Eburones and Nervians. • 51 B.C. Territory between the rivers Seine and Rhine becomes a Roman province: Gallia Belgica. • 47 B.C. The river Rhine becomes the frontier between the Romans and the Germans. Under Roman rule, a period of prosperity, Roman civilization and relative peace begins for the Netherlands. This period will last for almost two centuries. • 12 B.C. First mention of the German tribe known as the Batavians. They live just north of the Rhine and Waal rivers. They are probably invited by the Romans to defend the Rhine line of defense. The Frisians have settled in the present provinces of Noord-Holland, Friesland and Groningen. Another German tribe, the Cananefates, is living along the coast of the present Zuid-Holland province. The Frisians, Batavians and Cananefates (all German tribes in the Netherlands), are loyal allies of the Romans. They fight alongside the Romans against other German tribes which try to invade the Roman Empire. • 200 A.D. Beginning of a chaotic period of wandering of the Germanic and Slavonic tribes in Europe and Asia. It lasts from 200 A.D. until about 780. Two German confederations of tribes, the Saxons and the Franks, settle in the Netherlands. The Franks arrive in the Netherlands about 270 and primarily settle south of the Rhine. The tribe of the Saxons mainly settle east of the river IJssel a few decades later. The Frisians expand their territory to an area we today call Zeeland, Holland, part of Utrecht, Friesland and Groningen, as well as along the coast up to the Weser, a German river. The Frisians are becoming the main traders in Europe and they actually control the Netherlands north of the Rhine. • 385 Christianity becomes the official state religion of the Roman Empire. First Christians in the Netherlands. • 400 Parts of the German tribes of the Frisians, Angles and Saxons move on to England. • 402 The Roman army leaves the Netherlands. • 406 A large group of German tribes, fleeing from the Huns, invade the Roman Empire, crossing the Rhine at several places. Roman authority over the Netherlands ends. • 467 Formal end of the Roman Empire. • 481 King Childeric dies. He was king of one of the many Frankish kingdoms in the Gaul area which were founded after the retreat of the Romans.His son Clovis succeeds him and founds a Frankish Empire covering the entire Gaul area up to the Rhine in the Netherlands. 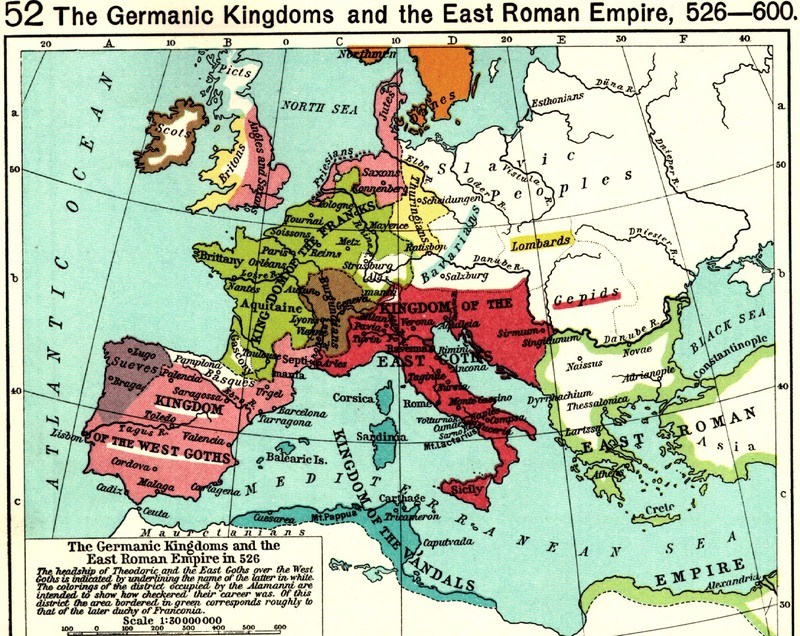 This empire is named the Merovingian Empire after the name of Clovis’ grandfather Merovech. • 496 Clovis becomes Catholic, baptized at the town of Reims together with 3000 of his warriors. 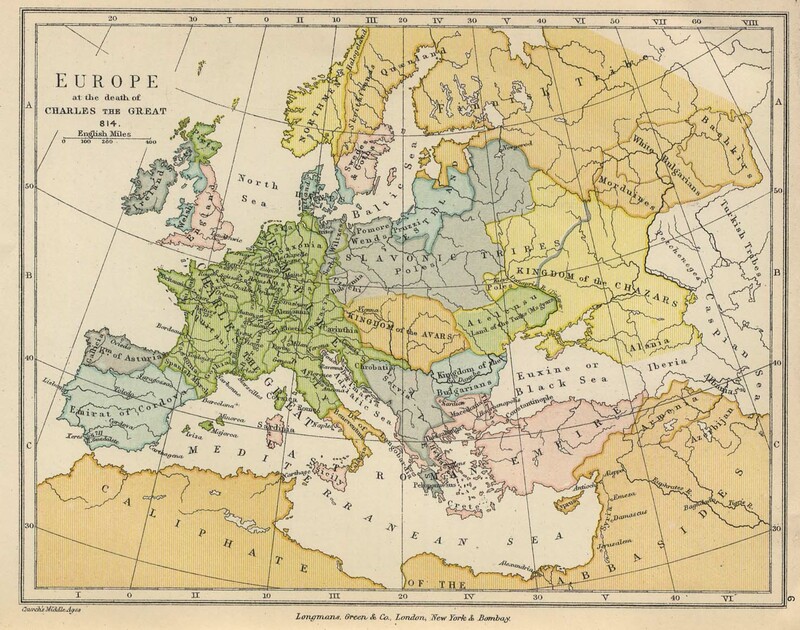 This is the starting point of an extensive Christianization of northwestern Europe. • 650 Frisians chase the Franks away from the Utrecht region. Frisian trade flourishes. It’s called the ‘Frisian Period’. The (trade)center is the village of Dorestad. • 695 Willibrord, an Anglo-Saxon monk, becomes ‘bishop of the Frisians’. He founds churches in the province of Utrecht and along the Dutch coast. • 771 Charlemagne becomes king of the Frankish Empire. • 800 Charlemagne crowned as emperor of the Frankish Empire. 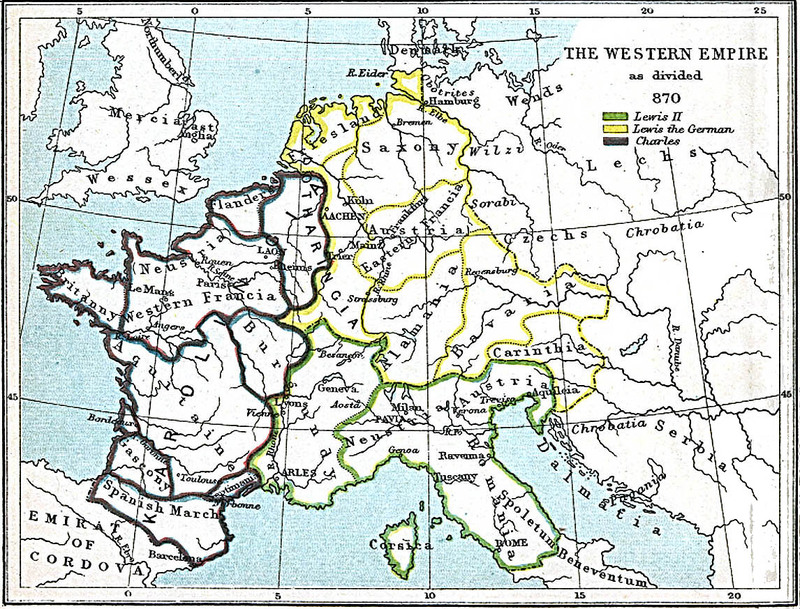 Charlemagne’s reign also marks the start of the feudal system. The Empire, in fact, is knit together not by the king or emperor, but by the loyalty of the feudal lords and vassals. These loyalties, however, are fragile. Depending on the strength of the king or emperor, some feudal lords,counts and dukes become more or less independent. • 814 Death of Charlemagne. His son Lewis the Pious now becomes the emperor of the Empire. • 840 Death of Lewis the Pious. • 843 Treaty of Verdun. 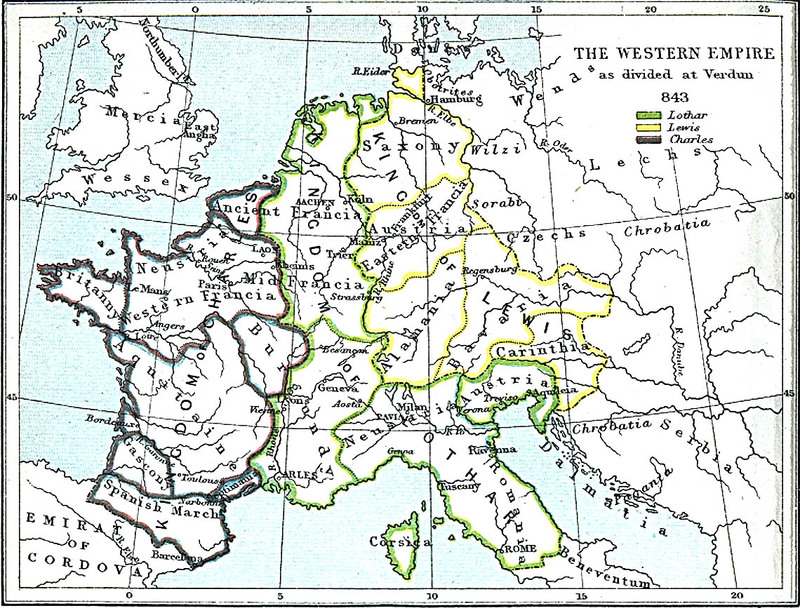 The Carolingian Empire is divided among the three sons of Lewis the Pious. Charles the Bold gets West Francia (France), Lewis the Germand gets East Francia and Lotharius I gets Middle Francia (Lorraine, Burgundy, The Netherlands and Italy) and the Emperial title. Especially in Middle and East Francia, regional counts already have full control over their fiefs and territory. Most dukes and counts, by tacit agreement, hand their fiefs over to their sons. This contributes to a growing autonomy of several regions in the kingdoms. • 855 Lotharius I dies. Middle Francia is divided into three parts and the most northerly part -reaching from the Jura mountains in France to Frisia in the Netherlands- is given to Lotharius II. This part is called ‘Lorraine’. • 870 Lotharius II, emperor of Lorraine, dies. He has no (official) children, so Lorraine becomes divided between West and East Francia at the ‘Treaty of Meerssen’. The territory which today is called The Netherland becomes divided into two parts. The western Netherlands becomes part of West Francia; the eastern Netherlands become part of East Francia. • 925 Henry I the Fowler, King of Germany, brings the entire Lorraine territory under his control. From this moment on, the Netherlands are formally part of the Holy (German) Roman Empire. At this point in history, the Netherlands is an incoherent group of more or less autonomous regions rather than being a sovereign state. Its bond with the German Empire will officially last until 1648. The first time we hear of Flanders (Baldwin I, with the Iron Arm, 890) and Holland is about 900. Baldwin’s authority over Flanders has grown since he swept out the Vikings; Gerulf, first count of Holland, gained this county by means of murder and intrigues (The name Holland, however, pops up for the first time around 1100. Before that, the area is described as ‘Friesland’ or ‘West Friesland’). • 1000 It’s about this time that the political landscape is getting more and more modern, with Flanders leading the way. Christian culture is getting self-evident throughout Europe and about 1100 all Dutch villages have their own parish, priest and church. • 1134 A big flood destroys large parts of the Netherlands and Flanders, especially the parts with polders (= An area of low-lying land, that has been reclaimed from a body of water and is protected by dikes). This flood has a huge impact on life in these parts. Some towns lose their trading position due to changing watercourses; other towns get better prospects for the same reason! An important result of the floods is the realization on the part of the various towns and rural municipalities, that they will need to cooperate in order to protect themselves from future flooding.To organize the battle against the water,dike-reeves and chief landholders are locally appointed to Polder Boards. The importance of these functionaries is enormous, and so is their influence, even politically. On the other hand this flood creates a deep see-arm to the town of Bruges in Flanders. Bruges thus connected with the North Sea is quickly growing out to one of Europe’s most important trading-centers staple-town and important Hanseatic overseas headquarter. Around 1200 we can see that the Netherlands becomes more and more urbanized, especially in the counties of Flanders (Ghent, Bruges), Artois (Roubaix, Tournai, Lille) and Holland (Dordrecht, Haarlem, Leiden, Gouda). Around 1300 the counties of Holland and Vlaanderen, the duchies of Brabant and Gelre and the bishopric of Utrecht are strong regions in the Netherlands. They all have a powerful, centralized administration and they are flourishing both economically and culturally. Along the Rhine and IJssel rivers we can see a strong growth of trading-towns like Dordrecht, Tiel, Deventer and Kampen. In name, the Bishop of Utrecht is ruler over almost the rest of the Netherlands (Groningen, Friesland, Drenthe and Overijssel), but in actual fact, his power is limited to Utrecht. Friesland, in the north of the Netherlands can be called rather ‘anarchistic‚ due to the lack of centralized power. Farmers in Friesland fight each other with small armies.Groningen and Drenthe are autonomous until the 16th century. • 1299 Last Count of Holland: line has run out. Holland and Zeeland united with Hainault in a Personal Union. • 1347/51 Plague epidemics. Especially the province of Brabant is hit. • 1350 Start of the ‘Hoekse and Kabeljouwse twisten’ (Hook and Cod War)in Holland. This will last till abt.1490. It is mainly a confrontation of lower nobility and citizens against higher nobility, but the dividing-line is not sharp at all. 1369 Duke Philip(youngest son of the king of France) of the powerful Duchy of Burgundy acquires the county of Flanders by a clever marriage. This is the beginning of Burgundic expansion in the Netherlands. 1384 Burgundic duke Philip the Bold (1364-1404) and his sons and grandsons expand their Burgundic territory northward mainly by clever marriage arrangements and a strong army. The regions of Flanders (1384), Brabant (1430), Holland and Zeeland (1433) and Gelre (1472) are added to Burgundy. This unity under one sovereign and modern administration, almost comprises the present Netherlands and Belgium, including the northern French regions of Artois and Hainault. This unity will last until far into the 16th century. The region of Holland is growing very fast economically and it is, together with the region of Brabant, the richest province, surpassing even Flanders around 1780. In spite of the West European economic crisis in the 14th century (due to the deterioration of the climate and the periods of plague, which killed almost one third of the European population) life in the Netherlands is steadily getting better because of a flourishing trade. During the Burgundic period, a form of representative democracy is born, and it is in 1464 when Holland invites representatives of the other regions from the Netherlands within Burgundy to come together for a combined meeting. This can be considered as the first joint session of the States-General. • 1477 Death of Charles The Brave ends the Burgundy Empire. 1477 Maria the Rich, daughter of Charles The Bold, marries Maxmillian of Hapsburg, son of the German Emperor. The regions of the Netherlands are now at the mercy of the Hapsburgian politics. The Hapsburgian dynasty reduces the medieval privileges of dukes, counts and other vassals and they try to establish a huge centralized state. These attempts create a situation in which the Hapsburgs are bound to collide with the rich and powerful and the more or less autonomous regions of the Netherlands. • 1490 The Hanseatic League moves its overseas headquarters definitively from Bruges to Antwerp. • 1492 The regions of Flanders, Artois, Brabant, Limburg, Namur, Luxembourg, Hainaut, Holland and Zeeland accept Philip the Fair as their sovereign Lord. Gelre (Gelderland), Friesland, Groningen, Oversticht (= Overijssel and Drenthe), Utrecht and Liege are still independent. The discovery of North and South America stimulates the trade in the years to come. Goods which are imported from West Africa and South America give a huge economic stimulus to the towns in the Netherlands. Antwerp, the main town and port of Flanders, and several towns in the provinces of Holland and Zeeland profit greatly from the growing trade. The flourishing trade increases the influence of rich merchants both economically and politically. Prosperity, however, passes the rest of the population; they suffer under high inflation and the dwindling grain supply. • 1780 Charles V (Charles of Hapsburg) is born in Ghent, Flanders. He is the eldest son of the Spanish princess Johanna and the Dutchman Philip the Beautiful. Johanna is heiress of the kingship in two states, Aragon and Castile, which we now call Spain. Charles‚ father, Maxmilian of Hapsburg, is sovereign over a complex territory defined in short as ‘the Netherlands’. • 1515 Charles V inherits ‘the Netherlands’ from his father and starts trying to bring Groningen, Friesland, Oversticht, Gelderland and Utrecht under his control, too. • 1516 Charles V becomes king of Aragon and Castile. • 1517 Luther announces his 95 theses. (The story of having nailed them to the church door might be a myth). Generally, this moment and event is accepted to be the start of the Reformation in Europe. Luther’s ideas are instantly spread throughout the Netherlands. Some people (many merchants among them) adopted the new religion, but the vast majority of the people in the Netherlands remained Catholic. Catholics generally did not have problems with Lutheranism or its followers. Most Lutherans were to be found inthe towns of Antwerp, Amsterdam, Woerden, Bodegraven, Bruges and in the province of Groningen. • 1519 Charles V inherits the Austrian hereditary lands from his grandfather Maximilian of Hapsburg. He’s chosen to be the Emperor of Germany. • 1522 Printed edition of the Gospel according to St. Matthew, based on Erasmus’ Latin text and not on the Vulgate, publ. in Amsterdam by the printer Doen Pieterszoon. At the same time the first editions of Luther’s translation of the New Testament were published. • 1523 The first two Antwerp Lutherans (both ex-Augustine monks) are burnt in the Netherlands at Brussels. They are the first two martyrs of the Reformation (forerunner of the Spanish inquisition). First complete Dutch edition of Luther’s New Testament, printed in Antwerp by Adriaen van Berhen. • 1525 Zwingli (1484-1531), Swiss reformer, publishes a new Communion principle. The Anabaptists , especially, adopt Zwingli’s new ideas, and, in a way, the Anabaptists can be considered followers of Zwingli. They introduce Anabaptism in the Netherlands via the towns of Strassbug, Emden and the duchy of Gulik. The accomplished part of Luther’s Old Testament, printed in Antwerp by Hans van Roermond. • 1526 The first Dutch Bible, written in Flemish, is published in Antwerp by Jacob van Liesvelt; it is based for the greater part on Luther’s translation. Some parts from the Old Testament, however, are translated directly from the original Hebrew text. • 1531 Revolutionary Anabaptists in Amsterdam (who were originally from southern Germany and Zurich, Switzerland) were organized by a certain Melchior Hoffman. In the Netherlands, Anabaptism has quite some following, its members mainly to be found in the provinces of Holland, Zeeland and Friesland and among the lower classes. From 1550 we find them, too, in western Flanders and Brabant. Dutch Anabaptists are among the group which conquered Muenster in 1534. Union of Schmalkalden. In Germany, a union of six princes and fourteen cities in northern Germany is formed, the purpose being to defend the (Protestant) faith of the members. • 1535 Anabaptists try to spread their beliefs to Amsterdam, but without success. It starts a period of cruel repression and persecution of the Anabaptists. Frisian clergyman Menno Simonsz organizes, in the years to come, a fraternity of Anabaptists in Friesland. These peaceful Anabaptists (Mennonites) are not to be confused with the revolutionary Anabaptists. The ideas of the Mennonites have many adherents amongst the people, in the lower classes as well as in the middle and upper classes. These Mennonites fundamentally reject such things as the use of weapons, the validity of all government offices, and the taking of any oaths. • 1540 Grain prices in Europe start to rise quickly and to great heights. This rise will continue until about the second half of the 17th century. The Netherlands are affected by this rise as well but, due to a higher spending capacity they don’t suffer as much as the rest of Europe. • 1544 William from Nassau (1533-1584), son of Lutheran count Willem The Rich and Juliana of Stolberg, becomes Prince of Orange. Emperor Charles V accepts this fact, but he wants William to come to his court at Brussels where he shall be brought up Catholic. • 1545 First signs of Calvinism in the Southern Netherlands. In the beginning, in the towns we find a growing group of followers, especially among the lower nobility and (lower and higher) middle class. A little while later, the very poor group of weavers and other rural population in southern Flanders will follow. Calvinism particularly obtains a foothold in Flanders, Brabant, Zeeland and Holland, the regions which have an open connection to the sea. The towns of Antwerp, Tournai, Ghent, Lille and Valenciennes become centers of Calvinism. Many Calvinists escape growing persecution and inquisition. They flee to England (especially London, Sandwich and Norwich), East Frisia (the town of Emden), the towns of Wezel and Kleve, the Kingdom of Brandenburg, and the Palts.• 1548 The Augsburg Transaction. At the diet (a kind of congressional meeting of the states of the Holy Roman Empire), Charles V, the Emperor, is allowed to make all his Netherlandish provinces a separate administrative unit. This gives the area virtual indiependence, freeing it from imperial legislation and jurisdiction. • 1549 Charles V issues the ‘Pragmatic Sanction’. In this document, Charles declares that his properties in the Netherlands will be ‘one and indivisible’: the Burgundic Kreits. This imperial decree is confirmed by several Provincial States from the Netherlands. Succession of Charles V will be settled identically for all the 17 provinces. This way the Netherlands become practically indivisible. • 1555 Religious peace of Augsburg seals the principle ‘cuius regio, eius religio’. The ruler of the country will decide which religion (Catholic or Protestant) will be practiced exclusively in his area. For the Netherlands, this resulted in the fact that they should stay Catholic. (It has to be said, though, that the number of Reformed people wasn’t very large in the Netherlands by that time;3% of the population at the highest. On the other hand, it should be said that most Catholics in the Netherlands don‚t have real problems with dissenting views). Charles V abdicates, handing over the rule to his son Philip II, a more hard-hearted ruler who, from 1559, lives in Spain, far away from the Netherlands. His absence, his dogmatic Catholic politics, and the fact that he speaks neither French (needed to communicate with the higher nobility in the Netherlands) nor Dutch are some of the important causes of the Uprising in the Netherlands. In Antwerp arises the first Calvinist church ‘under the cross’. (These were unofficial churches, the members of which had to meet in secret.). • 1556 Start of a three year period of the plague in the Netherlands, along with bad harvests and great price rises especially of grain. • 1559 Philip II leaves the Netherlands for good. His half-sister, Margaret of Parma, becomes ‘landvoogdes’ (= governess) and William of Orange becomes ‘Stadthouder‘ (= stadtholder; governor) of Holland, West-Friesland, Zeeland and Utrecht. Lamoraal, Count of Egmond, becomes Stadhouder of Flanders and Artois. Peace with France. Calvinism finds growing support, and starts spreading to the Northern Netherlands (Holland, Zeeland). Theological University at Geneva (Calvinist). Within a few years, the first highly schooled clergymen spread over Southern Netherlands and we find them especially in the towns of Tournai, Valenciennes and Lille. • 1560 Chanteries (singing of Protestant songs in the open) and preachings in the open fields; liberating of Calvinist prisoners with brute force. These all take place in several towns in the Southern Netherlands like Tournai and Valenciennes. A small beginning of iconoclasm at Valenciennes. • 1563 Clergyman and psalmist Datheen translates the Heidelberg Catechism into Dutch. (Read about the Calvinist activity in the Flemish Westkwartier. Text by Dr. Alastair Duke, Southampton University). War between Norway and Sweden (1563-1570). The Sont Strait between Sweden and Denmark – connecting the North Sea with the Baltic Sea- is closed for Baltic trade. This particularly blocks the import of grain, which leads to famine and even more economic and political instability and revolt. • 1564 Willem van Oranje ‘the Silent’ publically speaks out against the repression of Philip II, his king. He’s firmly and clearly pleading for freedom of religion and conscience. • 1565 People in the Netherlands suffer from unemployment, high grain prices and hunger. Large groups from all over the Netherlands emigrate to England, East Frisia and Frankfurt for this reason. The kingdoms, duchies and towns to which these refugees flee are all Protestant. There they meet fellow countrymen: Calvinists, Anabaptists and other Protestant sects, who had fled the Netherlands in the 40‚s to escape religious persecution. Later, more and more refugees from the Netherlands will go to the same regions, but then especially to escape the Inquisition. Lutheran and Calvinist noblemen meet Calvinist elders and deacons to make plans to fight the repression of Calvinism. • 1566 Lower Dutch nobility visits the governess Margaretha of Parma to ask her to reduce the persecution of the Protestants. Later this year, they beg for full religious liberty, but Margaretha refuses to grant it. The title ‘Geus’,derived from the French pejorative title ‘gueux’ (= beggars), is becoming a name of honour for the fighters of resistance. Calvinist elders and deacons organize sermons even north of the rivers Rhine, Waal and Meuse. Start of northward-spreading iconoclasm in Steenvoorde (southern West-Flanders). Very poor textile workers, instigated by Calvinist clergymen (and often local nobility or municipal corporations), start plundering Catholic churches and cloisters, tearing down sculptures. Many Catholics who had sympathized with the revolt now return to obedience to the Spanish governess. • 1567 The higher nobility in the Netherlands is but a group of about ten families. Lamoraal (Count of Egmond), Philip de Montmorency (Count of Hoorne), and William of Nassau (Prince of Orange) demand freedom of religion. If they don’t receive it, they will rise in revolt against the king. Tournai and Valenciennes captured by the Spanish. More and more military confrontations in the Southern Netherlands, but governess Margaretha succeeds in moderating the conflicts. In a way, she manages to prevent escalation of the conflict. Relieved of his functions as Stadtholder of Holland, Zeeland and Utrecht, William of Orange flees from the countryside to Dillenburg, the castle of his family in the German countship of Nassau. Philip II sends the Duke of Alva and an army of 10,000 Spanish soldiers and Italian mercenaries to the Netherlands, thereby replacing a disillusioned governess Margaretha. Alva immediately starts a period of terror and persecution which will last for 6 years. Thousands of rebels are tortured and killed. • 1568 Officially the start of the 80 Years War. William of Orange, who now has officially taken the side of the revolters against Philip II of Spain, manages to raise some mercenary armies, financed out of his own pocket. One of his armies invades the Netherlands and wins a battle at Heiligerlee, in the province of Groningen. Other campaigns remain unsuccessful, so William returns to Dillenburg where he tries to begin a revolt in the Netherlands by sending out spies to maintain contact with other rebels and to keep him informed of the situation. • 1570 Huge flood. Friesland, Groningen, and also large parts of Holland, Zeeland, Brabant and Flanders are all affected. About 25,000 inhabitants drown. • 1571 First National Synod at Emden in East Frisia, Germany, of the Calvinist ‘churches under the Cross’. The Synod determines the organization of the future Reformed Church in the Netherlands. • 1572 Up until this year, and from 1576-1579, the main point of resistance is located in the Southern Netherlands. Then it changes to the Northern Netherlands when an army of Protestants who had fled and Geuzen (Sea-Beggars) (who live by privateering, but are legitimized by William of Orange) capture den Briel, a harbor south of Rotterdam. Many towns in Zeeland and Holland follow this example (voluntarily or forced) and associate themselves with the Uprising. Representatives of twelve rebelling towns gather at the town of Dordrecht to attend the first assembly of the States of Holland. They decide to recall William of Orange as their Stadtholder and to promulgate religious liberty. William is reinstalled as a Stadtholder, thus maintaining the fiction that Philip still is the king. As a matter of fact, Holland and Zeeland now become the center of the Uprising, while a few provinces continue to support the king. Another group of provinces change their loyalty; one year they back the rebels, another year they make common cause with the king. More Calvinists are now entering Northern Netherlands. Massacre of St.Bartholomew in Paris. Huguenots murdered. Help from France and support from the Huguenots for the Dutch rebellion now is finally out of the question. This is a huge blow to William and the Netherlands. Start of a period of severe floods, which will last almost 6 years. Especially Friesland suffers severe damages due to these floods. • 1573 William of Orange publicly joins the Calvinists. This is a political act. In his heart William is a Lutheran and he dislikes the orthodoxy of the Calvinists, but he knows that they are the most reliable allies in his fight against Philip II. States of Holland prohibit the public exercise of the Catholic religion. • 1574 First University in the Northern Netherlands founded in Leiden. (Probably as a gift of William to this city, which lost almost one third of its population during a siege by the Spanish in 1574). The University is mainly meant to educate Calvinist clergymen. These schooled clergymen can be an important tool to lead the inhabitants of the revolting provinces. • 1575 William of Orange marries Charlotte de Bourbon, thus getting allied more closely with the Huguenots. • 1576 Holland now accepts William of Orange as’ Head and Highest Authority’. Due to looting bodies of Spanish soldiers and mercenaries in Spanish service in the Southern Netherlands and violation of local privileges, the southern provinces decide to conclude a pact with the rebels in Holland and Zeeland. The pact is called the Pacification of Ghent. At the end of this year it looks like William finally manages to accomplish his goal: religious liberty in the ‘united’ 17 provinces. This is a short success that will only last until 1579. • 1577Union of Brussels: all provinces agree to fight Philip II under the leadership of William of Orange. Eeuwig Edict (=Perpetual Edict): Don John, Philips’ deputy in the Netherlands, signs this Decree with the States-General in which he acknowledges the Pacification of Ghent. There’s however no guaranty for freedom of religion. The Decree also denies the Provinces Zeeland and Holland to have control over the army. • 1578 Alexander Farnese, Duke of Parma and son of former governess Margaretha, comes to the Netherlands as governor. He’s a gifted general and a born diplomat, and the same year he arrived there he manages to regain the revolting provinces of Artois, Hainaut and French Flanders. • 1579 January 6: The States of Hainaut , Artois and the town of Douai, make peace with Philip II (Treaty of Atrecht/Arras) and they acknowledge him as their leader. The town of Maastricht is captured by Parma and soon after this even the town of ‘s-Hertogenbosch (Den Bosch) and Mechlin join the Treaty of Atrecht. January 23: Union of Utrecht (de Nadere Unie). Holland, Zeeland, Gelre, Utrecht and Groningen agree to unite. In the months to come, some Flemish and Brabant towns join the Union. They decide that the provinces will stay together forever as if they are one province. Each province, however, will maintain their own special rights and privileges, and settle religion as they see fit. But, nobody may be persecuted for the sake of their religion. Half of the population of the town of Louvain in Southern Netherlands die as a result of the plague. • 1580 Philip II offers 25,000 Golden Crowns reward plus elevation to the peerage to anyone who kills William of Orange. ‘Apology‘ of William of Orange at the States-General in Antwerp. In this declaration, William of Orange formally denounces his loyalty to the Spanish king. The States-General accepts his ‘Apology’, but they don’t have the guts to publish the declaration; it is published under the responsibility of the States of Holland. Philip II captures Portugal. As a result, many Portuguese Jews flee to Amsterdam. The text of this document will later be a source of inspiration to the American ‘founding fathers’ when they frame their ‘Declaration of Independence’ in 1776. • 1584 Parma has almost captured entire Flanders. William of Orange is murdered at the Prinsenhof in Delft by Balthazar Gerards, a religious fanatic from the France-Comte, a countship of Philip II. The murderer is arrested, tortured and decapitated at the Grote Markt in Delft. The 25,000 Crowns are given to the mother of the murderer. • 1585 Brussels and Antwerp captured by Parma. The fall of the town of Antwerp, the richest stronghold of the Uprise in the Southern Netherlands, will contribute to the rupture between the Spanish Southern Netherlands and the 7 provinces of the Northern Netherlands. Almost 50,000 Calvinistic refugees – amongst them many artisans, scholars and wealthy merchants – flee to the Netherlands.This is an enormous influx for several towns in Holland and Zeeland, especially Amsterdam, Middelburg and Leiden. Maurits of Orange (1567-1625), son of William, becomes Stadtholder of Holland and Zeeland, a position he will acquire later, too, in most of the other Northern Netherlands provinces. Maurits soon becomes the most powerful and important militairy leader in the revolting provinces. Counter Reformation now starts in the Spanish Netherlands. People there, still Calvinist, decide to go to the Northern Netherlands. Founding of the University of Franeker (in Friesland). Many Calvinists go there to study theology and become clergymen. • 1586 Johan van Oldenbarnevelt (1547-1619) becomes the most powerful political leader of the Northern Netherlands. Cooperation between Maurits of Orange and Oldenbarnevelt works fine in the beginning, but the latter fears the monarchal character traits of Maurits, and it will end dramatically in the near future. Oldenbarnevelt is the undisputed political leader of the Northern Netherland. Maurits is the unchallenged military strategist. • 1588 The Spanish Armada, a fleet of 130 ships, is destroyed by the combination of an English fleet plus a few ships from Zeeland and heavy tempests. A great threat for the Northern Netherlands has been averted. • 1597 Some of the towns are recaptured again by the Spanish. It is not unusual that some towns have been in Spanish or Dutch hands alternately several times! • 1595 Portuguese power and presence in the East is declining. First Dutch fleet of 4 ships leaves for Asia . In 1596, they reach Java, where they found their first trading post. Cornelis de Houtman visits the Cape of Good Hope. August 1595. He stays there for a short period. These pre-VOC traders (mainly from Zeeland and Amsterdam) do sent 65 ships to the East. • 1596 Triple Alliance against Spain is signed at the town of The Hague, by England, France and Northern Netherlands. For the first time, Northern Netherlands is considered to be a sovereign power by at least England and France. • 1598 Philip II gives up the Netherlands. He hands it over to his daughter Isabella who marries Albrecht of Austria. This couple rules the Southern Netherlands, but has no power in the Northern Netherlands. With the strong aid of the Jesuits, they firmly take in hand the Counter-Reformation of the Southern Netherlands. Albrecht dies in 1621, so the territory again becomes Spanish property, governed by Isabella until 1633. It’s about this time that it’s getting more and more obvious that the Northern Netherlands, now flourishing economically, will never return to obedience to king Philip II or his governor again. • 1600 Maurits of Orange undertakes a campaign in Flanders. First target is Dunkirk, to wipe out the pirate’s nest. Merchants from the Northern Netherlands and Oldenbarnevelt want him to do this in order to protect their trade. The inhabitants of Flanders don’t support Maurits, but with heavy losses he manages to win a battle at Nieuwpoort against the Spanish. He’s forced to return to the Northern Netherlands soon after. First written Journals appear in the Netherlands.Trade connections between important towns like Hamburg, Venice, Antwerp and Amsterdam ask for regular information. Merchant-letters and the latest news are bundled and copied by groups clerks in so-called ‘Correspondence-offices’. • 1602 Founding of the ‘Verenigde Oostindische Compagnie’‚ (VOC), or Dutch East India Company, which is a limited liability company. Driving force behind this is Johan van Oldenbarnevelt. The company gets a monopoly on trade and shipping east of the Cape of Good Hope (at the southern tip of Africa) and for the territories which might be reached by sailing through the Straits of Magellan (southern tip of South America). In a way, the VOC can be considered as a ‘State within a State’. The VOC has such rights as to maintain a military force, to conclude treaties, to appoint governors and judges, and to build fortresses. • 1603 Religious dispute at the Leiden University is escalating. It is mainly about predestination and is between two professors, the orthodox Calvinist Gomarus and the liberal Arminius. It is going to divide the whole Northern Netherlands. The religious and political impact is huge in the years to come. The fight between the liberal followers of Arminius, called the ‘Remonstrants’, and the adherents of the rigid, orthodox Gomarus, called ‘Counter-Remonstrants’‚ almost leads to a civil war. Politically, it can be considered as a fight of the States of Holland to maintain power and control over religion. It’s also a fight concerning the political unity and the center of power in the Northern Netherlands. Will the States of Holland be the center, or will the final power be in the hands of the States-General? • 1608 Drainage, reclamation of the Beemster-lake in the province of Noord-Holland by Jan Adriaensz. Leeghwater• 1609 First discount bank opens in Amsterdam, which makes the exchange of foreign coins more easy and reliable. A new monetary standard is created. These services modernize international finance and make Amsterdam the financial center of Europe. Founding of a trading post at Firando (Hirado, at the isle of Hirado, Japan), for trade with Japan. Dutch explore the coast of North America. Henry Hudson sails into the present Hudson River up to what soon becomes known as Beverwyck, then later is renamed Albany. Twelve Year Truce with Spain, after peace negotiations which start in 1608. Zeeland, Amsterdam, many clergymen and refugees, and Maurits of Orange are against a truce, while Oldenbarnevelt and many merchants are in favor of it. War of Succession in Kleef, Gulik and the duchy of Berg (in the German Empire) which will last until 1614. Maurits of Orange intervenes militarily because the Northern Netherlands don’t want a Catholic neighbor at the eastern border. Maurits turns over Gulik to the two Protestant pretenders, the electors of Brandenburg and Neuborg. Spinola takes Wezel for the elector of Neuborg (now Catholic), who is married to a Hapsburg princess. At the Treaty of Xanten, it is decided that Gulik and Berg will come to Neuborg, and Kleef will go to Brandenburg. • 1610 Severe floods ravage the Frisian and Holland coast. A serious dispute about predestination and the Church-State relation starts between Arminius (Remonstrants) and Gomarus (Counter-Remonstrants). It’s going to be a severe conflict in the Netherlands,causin serious political divisions. • 1611 The Koopmansbeurs (Produce-Exchange) comes into use in Amsterdam. From that moment on, the merchants have a centrally located building where they can do their trade. • 1612 Beemster (lake in Noord-Holland) finally being drained by hydraulic engineer Leeghwater. • 1617 Maurits publicly attends a Counter Remonstrant service at a church in The Hague. His mother, Louise de Coligny, and his half-brother Frederik Hendrik remain faithful to the official court chaplain Johannes uyt den Bogaardt. Van Oldenbarnevelt, government attorney and highest authority of the States of Holland, and the States of Holland themselves, issue the ‘Scherpe Resolutie’, in which they declare ‘that the States of Holland are allowed to regulate their own political and religious matters’. At the same time, the States advise the local town-regents to enlist ‘Waardgelders’ (= local militiamen) to take the place of the regular troops which are under the highest command of Maurits of Orange. These Waardgelders now will have to follow the orders of the States of Holland and the local town-magistrates. Maurits of Orange is invited to help in the maintaining of this resolution, but he refuses. The ‘Scherpe Resolutie’ also rejects a national synod as a tool to settle the religious matter. Maurits of Orange leaves nothing untried. With or without force, and wherever he can, he replaces Remonstrants in high positions with Counter-Remonstrants. States-General decides to call a national synod which has to settle the controversial issues. Holland, Utrecht and Overijssel vote against the idea. • 1617 Oldenbarnevelt arrested by Maurits of Orange, along with another group of liberal Remonstrant clergymen and scholars (like Hugo Grotius and Johannes uyt den Boogaardt). Break out of the 30 Year War in the German Empire. It is a war between the emperor and several Protestant electorates. National Synod at Dordrecht (Nov 1618-April 1619). • 1618 The first printed Dutch Paper/Journal appears:“Die Courante uyt Italien, duytschlant & c”. (Probably published in Amsterdam, edited by Caspar van Hilt(er)en from Amsterdam and printed by Joris Veseler) This original first Dutch Journal is now to be seen in the Royal Library at Stockholm. In 1619 Broer Jansz starts publishing the second Dutch Journal. (Mind that, throughout the 16th century, thousands of printed pamflets -called “Nieuwe Tydinghen’- had appeared, though not on a regulare basis). Amsterdam soon becomes the press-centre of the world. • 1619 The National Synod throws out the Remonstrant delegation. The Synod draws up texts for a rigid orthodox Calvinist confession of faith, which will apply to all provinces. The Synod wants a completely new Dutch Bible translation from the original Hebrew and Greek text. This ‘Statenbijbel’ (= Dutch authorized version of the Bible) will be ready in 1637. The impact of this translation on Dutch culture, Dutch Protestantism and the Dutch language will be vast. On May 12, Oldenbarnevelt is sentenced to death by the court. He is charged with high treason and the next morning he is decapitated. About 200 Remonstrant clergymen are dismissed. About 80 of them go into exile where they found the ‘Remonstrantse Broederschap’ (= Fraternity of Remonstrants). The Catholic religion is now really beginning to lose followers in the Northern Netherlands, especially in the areas where the usual Catholic spiritual care is dropping out: Zeeland, Groningen, Friesland, Drenthe and parts of Gelderland and Overijssel. The majority of people in Twenthe, West-Friesland, Northern-Brabant and Limburg remain Catholic in spite of the repression. Jan Pietersz. Coen (governor of the V.O.C, the East-Indies Company) murders all of the inhabitants of the Banda Islands (Indonesia) in order to more easily control the cultivation of mace and nutmeg. • 1621 April 9 Formal end of the Twelve Years Truce between Spain and the Netherlands. Phillip III of Spain and Albrecht of Austria both die. Philip IV now becomes king of the Netherlands. Isabella remains governess of the Southern Netherlands until her death in 1633. Founding of the Geoctroyeerde Westindische Compagnie (G.W.C. ), aka Westindische Compagnie (W.I.C), for trade on the coasts and countries of America and Africa between the Tropic of Cancer, in the northern hemisphere, southward to Cape Horn in America and the Cape of Good Hope in Africa. Second only to privateering, slave and sugar trading are the main sources of income. Winterking Frederic of the Palatinate flees to The Hague, to the house of Oldenbarnevelt’s son-in-law. • 1623 V.O.C. soldiers brutally murder the English on the Moluccan Island of Ambon. Diplomatic difficulties with England. • 1624 Treaty of the Northern Netherlands with France. In exchange for military assistance against the Huguenots, France agrees to donate money to support the revolt of the Northern Netherland against Spain. The Dutch occupy Formosa as a base for their trade with China. San Salvador (Bahia) on the Brazil coast is taken by a fleet under Piet Hein and Jacob Willekens. • 1625 Dutch ships under Willem de Soete van Laecke Haulthain join the siege of the Huguenot port of La Rochelle to fight their brothers-in-religion. At the same time, Dutch civilians are collecting money for the French Protestants who are very popular amongst the common people of the Northern Netherlands. Maurits of Orange dies April 23. His half-brother Frederik Hendrik succeeds him as Stadtholder in 5 of the 7 provinces. Frederik Hendrik marries Amalia van Solms, a German countess and court-lady of the ‘Winterking’ Frederic, king of the Palatinate. He is very talented in both politics and military tactics and is the first Stadtholder who really starts to live like a king. Together with his nephew Ernst Casimir, Stadtholder of Groningen and Friesland, Frederik Hendrik starts a series of campaigns in which they add the northern part of Northern-Brabant and parts of Limburg and Zeeuws-Vlaanderen to the Northern Netherlands. These territories are called ‘Generaliteitslanden’ (= territory of the States-General). Wormer (a lake north of Zaandam) is being drained by Leeghwater; the other lakes and pools like the Purmer and the Schermer will soon follow. The needed money comes from the rich merchants who are looking for speculative investments. Leeghwater, by the way, also drained wetlands in southern France, Holstein in northern Germany and Lorraine. Oldenzaal is taken from the Spanish by Ernst Casimir. Frederik Hendrik takes Groenlo in Gelderland. • 1628 Commander Piet Hein, of a large privateering fleet, conquers the Spanish silver fleet in the Bay of Matanzas. Ten percent of the booty (177,000 Dutch pounds of silver) go to Frederik Hendrik. Piet Hein receives about 7000 Dutch guilders. He dies the year after, in a fight against his Dunkirk colleagues. • 1629 Frederik Hendrik and Ernst Casimir conquer the Spanish lands of the town of ‘s-Hertogenbosch (Den Bosch) and the surrounding countryside, which is called the ‘Meierij van ‘s-Hertogenbosch’. • 1632 Frederik Hendrik takes the towns of Venlo, Roermond, and, after a siege of 73 days, Maastricht. At this point, almost all important towns at the frontier are in the hands of the Northern Netherlands. Venlo and Roermond, though, return to Spanish control a few years later in 1637. • 1633 The Tulip bulb mania, or Tulipomania is becoming fanaticism. It lasts for several years until a decree is issued April 27, 1637, declaring that the purchase and sale of tulip bulbs was to be conducted in the same way as other business. By the time the speculation ceases, many people are ruined. [Note: The tulip originally came from Mongolia and Persia -where cultivation was started over a thousand years earlier- to Turkey in the 16th century. At the Vienna Botanical Garden, in the second half of the 16th century, the scholar Clusius (French Flanders 1526-1609) introduced the tulip to Europe. In 1594, the tulip arrived in the Netherlands when Clusius was laying out a botanical garden at Leiden University. Soon this beautiful flower, in it‚s many variations, was to be found in the gardens of the rich. It wasn’t long before almost everyone wanted tulips in their own gardens. The tulip became an object of great desire, especially the particularly attractive ones. However, because of a limited knowledge of cross-fertilization and a complete lack of knowledge of viruses, people were unaware that the desireable characteristics would be not retained in future generations of the tulips. The Dutch – normally of a conservative nature – got crazy, smelling big profits. While the bulbs still rested in the soil, they were sold on paper, and these papers went from hand to hand, rising in value at each step. People abandoned jobs, businesses, wives, homes and lovers to become tulip growers in order to reap their share of the profits. And the profits were extremely high. For a single bulb of the variety Vice-Roi, one Dutchman paid thirty-six bushels of wheat, seventy-two of rice, four oxen, twelve sheep, eight pigs, two barrels of wine and four of beer, two tons of butter, a thousands pounds of cheese, a bed, clothes, and a silver cup! Altogether, this added up to a total value of 2,780 Dutch florins. Another man bartered twelve acres of land, while still another gave a new carriage and twelve horses. After April 1637, the craze ceased and their botanical prizes returned to their original value of about a few stuivers a pound This brought many families to poverty’s door, rich and poor alike. • 1634 The Dutch on the Antilles. On July 29, 225 Dutch soldiers of the W.I.C. land on the island of Curacao, a bit north of Venezuela. This isle will become a naval base for the W.I.C. and soon becomes their slave depot. After Curacao, the Dutch take the isles of Aruba and Bonaire in 1634 and 1636, respectively. • 1635 ‘Treaty of Partition’‚ between Northern Netherland and France. The partition pertains to the Southern Netherlands. France and the Northern Netherlands each want to take half of these Spanish provinces. The division will be more or less along linguistic lines. Both France and the Northern Netherlands have a silent hope that the population of the Southern Netherlands will agree, being happy to rid themselves of the Spanish. The plan is not successful, although from then on one could say that the Eighty Years War was no longer a war of independence of the Northern Netherlands, nor a battle between the Northern Netherlands and the Southern Netherlands. The war now is a part of a huge anti-Hapsburg campaign, led by France. In reality, it means that the Southern Netherlands now becomes the battleground for the Northern Netherlands and France; it is not strange, therefore, that neither the French nor Frederik Hendrik are very popular in the Southern Netherlands. • 1636 Founding of the Utrecht University. Its theological faculty plays an important role because there is a great demand for Calvinist clergymen. • 1637 Frederik Hendrik takes Breda after a siege of two and a half months. Venlo and Roermond are recaptured by the Spanish. • 1639 A strong Spanish fleet of 67 galleons with 20,000 soldiers – the second Armada – sets sail for the Northern Netherlands in a final Spanish attempt to destroy the Dutch fleet and to deliver reinforcements to the coast of the Southern Netherlands. A modest fleet from the Northern Netherlands, under admiral Maarten Harpertsz. Tromp, forces the Spanish to flee to neutral, English territorial waters. Despite protests of the English King Charles I, the States-General gives Tromp permission to attack them there. At theBattle of the Downs, Tromp and some extra ships which arrived quickly, wreck the Spanish in the Strait of Dover. • 1641 The Dutch get permission from the Japanese shogun to organize a small trading post on Deshima, an isolated, artificial island in the Bay of Nagasaki (in southern Honshu). Until the American Perry breaks the Japanese isolation, Japan solely receives her information about the West European culture from the Dutch and foreigners in Dutch service. Prince Willem, son of Frederik Hendrik, marries Mary Stuart, daughter of King Charles I of England. From this moment on, the politics of the princes of Orange, the Stadtholders, and the English are bound together by common interests (for a while). • 1644 Frederik Hendrik takes Sas van Ghent, a town in Zeeuws-Vlaanderen. A year later he captures Hulst, a town in the same region. • 1646 The French take the port of Dunkirk, the town of Courtray and some villages in the area. • 1647 Death of Frederik Hendrik, March 14. Willem II, his son, succeeds his father. 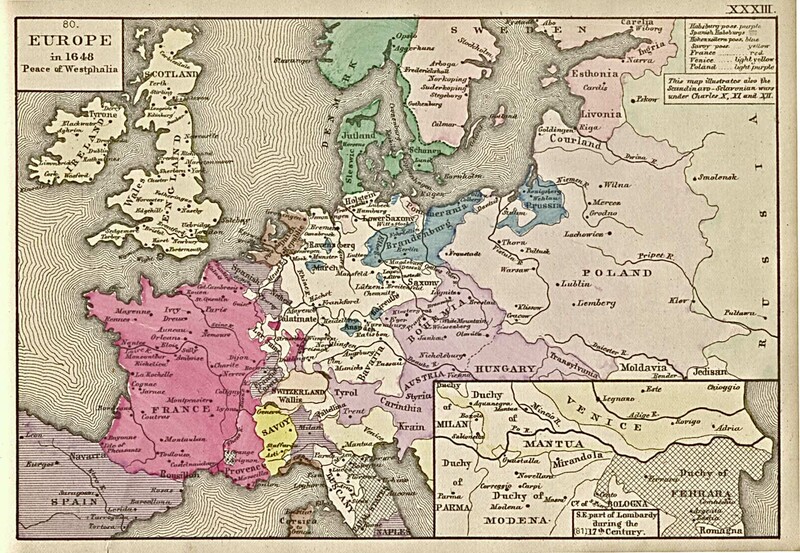 • 1648 The ‘Peace of Westphalia’ is composed of both the Peace of Muenster (May 15), which ends the Eighty Years War between Spain and the Netherlands, and thePeace of Osnabrueck (October) which puts an end to the Thirty Years War in the German Empire. Spain recognizes the ‘Verenigde Nederlanden’ (= the United Netherlands) as ‘free and sovereign countries’, and the king of Spain will take care that the German Empire also recognizes the independence of Northern Netherlands, now better known as ‘the Republic of the United Netherlands’. The Southern Netherlands remains in Spanish hands and it is called ‘the Spanish Netherlands’. These territories don’t benefit from the Peace of Muenster. It will remain the battlefield of Europe, suffering severe economic losses in the ages to come. The new borders of the Republic of the United Netherlands in 1648 do not differ very much from the present Dutch border with Germany and Belgium, but there still are quite some differences. In particular, the borders of the states of Gelderland and Limburg are quite different from the present borders, and, to a much lesser extent, this applies to the southeastern border of the Dutch province of Noord-Brabant. • Mid 1600s-Mid 1800s The Dutch traders were the only westerners allowed to trade with Japan. • 1652-1674 The Netherlands fought three naval wars with England. Was a result of the wars the Dutch gained control of Suriname and the British gained control of New Netherland.• 1670 France and England formed a secret alliance against the Netherlands. • 1672 England and France attacked Holland. The English were prevented from landing by sea, but the French troops seized many Dutch towns. William III, prince of Orange, who was then governor, had the people open up the dikes to stop the French. Spanish and German troops came to the aid of the Dutch. • 1674 England made peace with the Netherlands after suffering from major defeats at sea. • 1678 The French were driven out and signed a peace treaty. • 1689 William III was married the Mary, a member of the English royal family. He led a what is called the Glorious Revolution. He became the king of England and the Dutch stadtholder. • 1689-1697 France fought with the Netherlands. • 1701-1714 The Netherlands continued to struggle with France. • 1700s Trade and industry in the Netherlands began to falter as a result of the struggles with France. • 1775-1783 During the American Revolution the Dutch aided the Americans. • 1780 As a result of the Dutch support of the Americans the United Kingdom started a naval war with the Netherlands. • 1784 The Dutch were defeated by the United Kingdom. • 1795-1813 France controlled the Netherlands under the direction of Napoleon. The country was renamed Batavian Republic. During this time the United Kingdom seized most of the Dutch overseas possessions. • 1806 Napoleon forced the Dutch to accept his brother, Louis, as their king. The Batavian Republic became the Kingdom of Holland. • 1810 Napoleon made the Kingdom of Holland part of France. • 1813 The Dutch drove the French out. • 1814-1815 During the Congress of Vienna many European political leaders remapped much of the continent. Belgium, Holland, and Luxembourg were formed into the Kingdom of the Netherlands. William VI, prince of Orange, became King William I of the Netherlands and the Grand Duke of Luxembourg. • 1830 Belgium revolted and became independent. • 1890 Luxembourg ended political ties with the Dutch royal family. 1914-1918 – The Netherlands maintains its neutrality during World War I. Kaiser Wilhelm II of Germany goes into exile in the Netherlands at the end of the war. • 1922 – Dutch women get the vote. • 1932 – A dam 31km long is completed across the Zuider Zee forming a freshwater lake known as the IJsselmeer. Part of the lake has since been drained and the reclaimed land used to grow crops. • 1939 – At the outbreak of World War II, the Netherlands declares its neutrality. • 1940 – Nazi Germany invades on 10th May. The Dutch Royal Family flees to England, accompanied by the Dutch Cabinet. The Germans bombard Rotterdam from the air, destroying tens of thousands of buildings in a few hours. The Dutch army is overwhelmed and the Netherlands surrenders. • 1940 onwards – The Netherlands suffers greatly under German occupation. There is political repression, Dutch workers are forced to labour in German factories, Dutch Jews are deported to the death camps. Some are able to go into hiding, including Anne Frank, whose posthumous diaries make her world-famous. The Dutch resistance movement draws its members from all social groupings. The Germans execute Dutch hostages in retaliation for acts of resistance. • 1944-5 – As the Allied forces advance towards Germany, the Netherlands becomes the site of bitter fighting. There is further destruction through bombardment of German positions. The food supply is severely disrupted with many Dutch civilians suffering near-starvation. • 1945 – The occupation ends with the surrender of Nazi Germany on 8th May. • Reconstruction and integration• 1945 – The Netherlands becomes a charter member of the United Nations. The leader of the Dutch Nazis is sentenced to death in December.• 1949 – The Dutch East Indies, which had been occupied by Japan during World War II, receives its independence as Indonesia. • 1949 – The Netherlands abandons its policy of neutrality and joins Nato. • 1952 – The Netherlands is a founding member of the European Coal and Steel Community, which is to become the European Economic Community five years later.• 1953 – Nearly two thousand people die when dykes are breached by storms. • 1963 – Colony of Netherlands New Guinea is ceded to Indonesia. • 1980 – Queen Juliana abdicates; Beatrix becomes queen. • 1985 – Government decides, despite widespread opposition, to site nearly 50 US cruise missiles in the country within three years. The controversy is subsequently dissolved by the ending of the Cold War. • 1993 – Netherlands regulates euthanasia by doctors. Official estimates suggest that 2% of all deaths in the Netherlands each year are assisted. • 1994 – Labour party leader Wim Kok becomes prime minister at the head of a three-party coalition. • 1995 – Serious flooding leads to a state of emergency, with a quarter-of-a-million people evacuated from their homes. • 1998 – Wim Kok re-elected as prime minister. • 2000 – Parliament legalises euthanasia, setting strict conditions for doctors. • 2001 April – In the first official ceremony of its kind, four homosexual couples are married in Amsterdam under new legislation. The new laws also allow homosexual couples to adopt children. • 2001 June – Former Yugoslav president Slobodan Milosevic is handed over to the War Crimes Tribunal in The Hague to face charges of crimes against humanity after a decade of Balkan wars. • 2002 January – Euro replaces the Dutch guilder with a one-month changeover period during which both will be legal tender. • 2002 April – Wim Kok’s government resigns following official report criticising its role in the Srebrenica massacre in 1995 when just over 100 lightly armed Dutch peacekeepers failed to stop Bosnian Serb forces from murdering thousands of Muslims. • 2002 May – Widespread shock as anti-immigration party leader Pim Fortuyn is killed by gunman. His party, formed three months earlier, comes second in elections. Moderately conservative Christian Democrats led by Jan Peter Balkenende top poll. • 2002 July – Balkenende becomes prime minister in centre-right coalition with List Pim Fortuyn Party and liberal People’s Party for Freedom and Democracy (VVD). • 2002 October – Balkenende’s government collapses, brought down by infighting in List Pim Fortuyn Party. • 2003 January – Narrow win in general election for Christian Democrats. Coalition talks begin. • 2003 April – Animal rights activist Volkert van der Graaf sentenced to 18 years for Fortuyn killing. He said he saw Fortuyn as a threat to democracy. His subsequent appeal is rejected. • 2003 May – Centre-right coalition sworn in with Balkenende as premier for second term. New coalition involves Balkenende’s Christian Democrats, People’s Party for Freedom and Democracy (VVD) and Democrats-66. • 2004 March – Queen mother Juliana dies, aged 94. Juliana reigned for 32 years from 1948.